The train system in Japan is excellent - on time, efficient and clean. For those of us wanting to head out to the mountainous regions, sometimes services can be limited, though larger ski and snowboard resorts often have shuttle bus services operating from train stations to their bases. This page presents a general overview of getting around Japan by train. The majority of the rail network in Japan is owned and operated by Japan Railways, most commonly known as JR. The remainder is owned by private railway companies. JR is made up of six regional passenger companies - JR Hokkaido, JR East, JR Central, JR West, JR Shikoku and JR Kyushu. JR East is the largest passenger railway company in the world and operates trains throughout the Greater Tokyo region as well as the rest of the north-eastern region of the main island of Honshu. Trains are generally a very fine way to get around Japan. Choice and coverage is, as you might expect, somewhat more limited in the mountainous regions - both in terms of area coverage and regularity of service - but if there is a service that goes to where you want to go, travelling by train is still often a pleasure to use with the bonus of fine views to be enjoyed. You are reading SnowJapan, so it's likely that you are going to be wanting to get to those snowy mountains! Some snow resort areas like Yuzawa in Niigata Prefecture are perfect for getting to by train, having two Shinkansen stations right in the centre of town which are close to ski lifts... you can literally be on a ski resort Gondola within 90 minutes of leaving Tokyo Station. Other snowy regions of Japan are less well served by the train network and most people going to those regions do so either by car or bus tours. Please refer to the individual Travel Guides in this section for region-specific information. 'futsu' These are local trains that generally stop at every station on the line. Rapid trains do not stop at some stations but they cost the same as local trains. Express trains stop at less stations than rapid trains and may be subject to an additional 'express fee'. 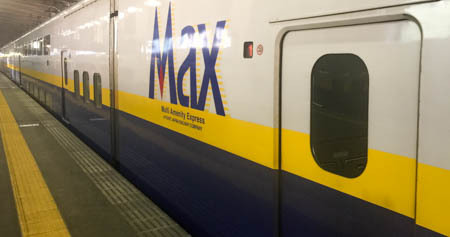 Limited express trains generally only stop at the major stations on a line and usually cost more, thanks to the added 'limited express fee'. Just learn the name - Shinkansen! Often referred to as 'bullet trains' (though not by Japanese people). Shinkansen trains run along their own tracks and platforms (see Yamagata for an exception to this). A limited express fee applies. 'josha-ken' The basic cost for getting from one place to another and it applies to all tickets sold by JR. The charge depends on the distance between the two stations. 'kyuko-ken' An extra charge which is applied if you travel on the 'kyuko' express trains. This charge also depends on the distance between the two stations. 'tokyu-ken' An extra charge which is applied if you travel on the 'tokyu' limited express trains or the Shinkansen. This charge also depends on the distance between the two stations and train type. Please note that non-JR companies sometimes have different ticket charges. Green Cars, when available, are the 'first class' carriages and they offer more comfort and space - but cost more. Note that the normal carriage seats on a Shinkansen are very comfortable. In our regional travel guides we refer to train lines by their Japanese name - Joetsu-sen, Oito-sen, Furano-sen, etc. Those travelling to Japan and thinking about using the trains may find the Japan Rail Pass to be an excellent option. Also called the JR Pass, the Japan Rail Pass is a rail ticket for visitors from overseas and valid for travel on all of the major forms of transportation provided by the JR group (with just a few exceptions). There are two types of ticket - for Ordinary Car and Green (First Class) Car - and the pass is time limited to a period of 7 days, 14 days or 21 days. Below are the costs in Japanese yen as of October 2015. Please note that actual cost in local currency is calculated based on the Banker's Selling Rate (BSR) at the time the Exchange Order is issued. It is important to note that you need to buy the Japan Rail Pass before you arrive in Japan. On buying the Japan Rail Pass from JR sales offices or agents outside of Japan, you will receive an Exchange Order. This cannot be obtained from within Japan. This Exchange Order must be exchanged at a JR Midori-no-madoguchi ticket office in a major station. Passports will need to be shown at the time of exchange and the Exchange Order must be used within three months of the date on which it was ordered. Once a starting date has been assigned to a Japan Rail Pass, it cannot be changed. Considerable savings can be made using the Japan Rail Pass if you plan to use the trains a lot, especially the Shinkansen bullet trains which are normally rather expensive. It is definitely worth finding out out if it might be worth it for your specific plans. Train tickets can usually be bought using cash (coins and notes) from vending machines at most stations, though they do not take credit cards. It might be worth noting here that vending machines almost always work in Japan - 'Out of order' signs are not something that you see often. If you have a problem with buying a ticket from a machine, just go to the nearest ticket office window and ask for your ticket though if you don't speak Japanese you might need some good finger-pointing and hand signs to communicate - have a map and information at hand. A few special cards are used a lot by locals in the city such as the Suica card (available from the JR ticket machines) and Pasmo (available from Tokyo Metro ticket machines). Both of these cards can be used on rail and bus lines in Tokyo, and some convenience stores also accept them for payments. A 500 yen refundable deposit is required and you can add to the cards wherever you see the signs on the ticket machines. Whichever train you find yourself using, you can be pretty much guaranteed that it will be a reliable, clean and generally top quality service. Japanese trains are of course famous throughout the world for being on time. And rightly so... delays and problems are rare. It's true that you can 'set your watch by them'. In the unlikely event of a delay for whatever reason, even a delay of just a minute or two, it will no doubt be reported and sincerely apologised for. There are many signposts in English within Japanese train stations - even in smaller stations outside of the main cities - and it is pretty easy to navigate around them even if you cannot read Japanese. Most stations have automated ticket gates but in rural areas you might even come across tiny 'mujin' 無人 (no people) stations that actually have no staff. With the automated ticket gates you will generally put your ticket in the machine on entering. Remember to take your ticket out on the other side - don't lose it. Trains are not always super crowded like in the stereotype images you have probably see, though travel in the city during rush hour and on one of the late night last trains and you might get to experience some of that. Venture out for an adventure into the countryside on a local train though and you might find yourself with a carriage to yourself. Ekiben are a special type of 'bento' boxed meals sold at train stations and platforms throughout Japan and sometimes also on the trains themselves. Some Japanese people wouldn't think of travelling by train without tasting a local ekiben. Ekiben has been a long tradition in Japan and continues to be a popular phenomenon, with some stations and regional ekiben becoming famous throughout the country. They can vary greatly between the regions. Ask for an 'osusume' (recommendation) to find out what is popular. Helpfully, photographs often accompany the boxes so you can get an idea of what is in them. It sounds better in Japanese than the literal translation of 'new trunk line'. The Shinkansen are almost worth a trip on, just to say that you have been on one. They are very fast, efficient, clean, safe, quiet (considering the speed you are going anyway), are almost always exactly on time and they stop exactly at the designated place on the platform. All in all, they're pretty cool. There are 6 main shinkansen bullet train lines running through Japan. There are also two 'mini-Shinkansen' lines that actually run on existing lines - the Yamagata Shinkansen and Akita Shinkansen. The Yamanote-sen is one of the busiest train lines in the Tokyo area and is operated by JR. It is a loop-line that goes round in both directions connecting most of the major Tokyo train stations. Trains are very regular, stopping at stations every few minutes. The trains that go in a clockwise direction are known as 'soto-mawari' (outer circle), while the trains going in a counter-clockwise direction are called 'uchi-mawari' (inner circle). All but two of the 29 stations on the Yamanote-sen are connected to other railway or subway lines. An estimated 3.68 million people ride on the Yamanote-sen every day. There are two main subway operators in Tokyo, making up the Tokyo Subway (tokyo no chikatetsu) which together consists of some 290 stations and 13 lines. Apparently, together they carry over 8 million people every single day. Fares are between 170 yen and 310 yen depending on the distance travelled. The system is highly efficient and the two companies are closely integrated. Note however that for single rides across Metro and Toei systems, a special transfer ticket is needed. That ticket costs 70 yen less than the sum of the Metro fare and the Toei fare, and is calculated based on the shortest possible route between the origin and destination stations. The Osaka Municipal Subway forms a large part of the public transportation system in the Greater Osaka and Kansai region and is operated by the Osaka Municipal Transportation Bureau. The Midosuji-sen line is the main line in the system and also the busiest. There are 8 subway lines and 123 stations. Fares divided into 5 sections and are between 180 yen and 370 yen for adult passengers; charges based on the distance travelled. One-day and other discounted tickets are available. The Sapporo Municipal Subway is an underground metro system in Sapporo, Hokkaido. It is operated by the Sapporo City Transportation Bureau. There are three lines - the Namboku (North-South) line, first opened in 1971 before the 1972 Winter Olympics; the Tozai (East-West) line and the Toho line. All three lines connect at Sapporo Station and so with the JR lines. At Odori and Susukino Stations, it connects with the streetcar above. There are two main hubs - Sapporo Station and Odori Station and most of the central area of the city is easy to get to (by foot) from one of those two stations. Ticket prices range from 200-360 yen depending on the distance travelled. One-day and other discounted tickets are available.